Los Angeles Chargers WR Mike Williams is back running routes at training camp. Williams has been sidelined since rookie minicamp in May where he sustained a herniated disk in his back. “He’s running. He’s doing well,” said Chargers head coach Anthony Lynn when speaking to reporters Monday. There was speculation last month that Williams may require season-ending back surgery due to the injury but that was not the case, and now the team is targeting an October return for the rookie. 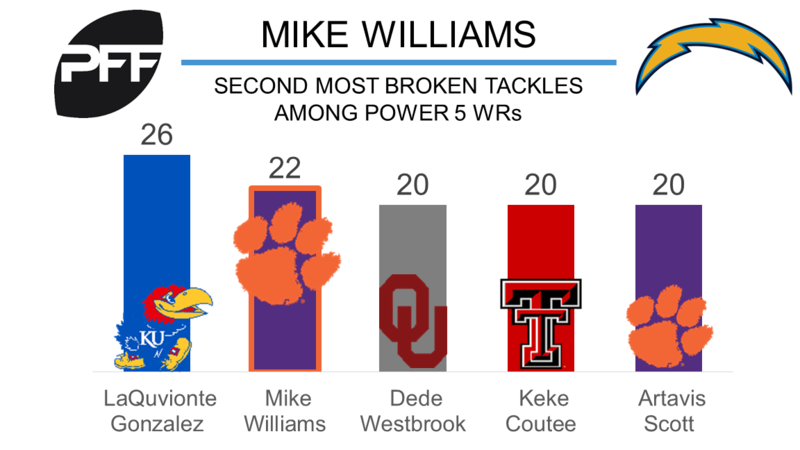 Williams proved elusive with the ball in his hands last season, his 22 broken tackles were the second most by a Power 5 receiver last season. He was also one of the more efficient wide receivers running routes, his 3.34 yards per route run was the seventh highest mark by a receiver with at least 108 targets. Williams was a real deep threat at Clemson last season, his catch rate of 53.8 percent on deep passes (a pass targeted 20 or more yards downfield) was the seventh best catch rate among draft-eligible receivers with at least 12 deep targets.